Description - Whether you are making a putting green in your backyard, or a putting green on the course, our Pro Putt Premium Turf Rolls are the perfect fit. With a two-toned turf blend, this artificial turf roll will not only look like real Bentgrass but will also perform just as good, if not better. Virtually maintenance free, your balls will always roll true no matter the weather. So spend more time getting your short game to the PGA level and less time fretting over fast or slow greens. A 15-year warranty backs our Pr Putt Premium Turf Rolls. Material – Polypropylene and polyethylene fibers. Weight – .482 Lbs. per square feet. 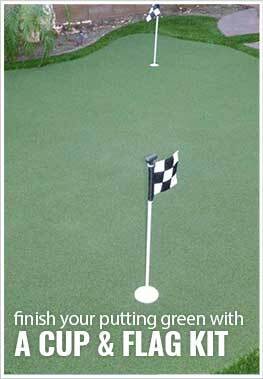 Recommended Uses – Our Pro Putt Premium Turf Rolls are great for both residential and commercial use and can be used putting green turf for backyard putting greens or as a putting green on a golf course and much more. Great as a backyard putting green or as a putting green on a golf course. Love my new golf turf!